A look at cool and fun facts about angels and how they were depicted in some of the most beautiful works of Medieval and Renaissance art. What did early Christians believe about angels? How did that belief evolve in the Middle Ages? What’s the story behind the Renaissance Cherub? It’s all here in, ‘Angels in Art: Angels Through the Ages’. The word angel comes from Old English ‘engel’ and Old French ‘angele’. Both terms come from the earlier Latin word, ‘angelus’, meaning, “Messenger of God”. In Medieval and Renaissance art, angels are often depicted as messengers as seen here in Fra Filippo Lippi’s ‘The Annunciation’ (1450-1453). The Angel Gabriel announces to Mary that she will give birth to Christ. This piece was in the Palazzo Medici and commissioned by the famed Medici family. The terms “angel” does not describe the spiritual being, it described what they did. St. Augustine clarified this point saying, “‘Angel’ is the name of their office, not of their nature. If you seek the name of their nature, it is ‘spirit’; if you seek the name of their office, it is ‘angel’: from what they are, ‘spirit’, from what they do, ‘angel'”. These 2 carved angels decorate the beautiful doors in the medieval chapel of Saint Chapelle in Paris, France. In the Middle Ages, in addition to being messengers, angels also carried the soul to Paradise. In this painting, from the National Gallery in London, England, we see Angels carrying Saint Bertin to Paradise in Simon Marmion’s masterpiece, ‘The Soul of Saint Bertin carried up to God’ (1459). Early Christians borrowed many of their ideas and their understanding of angels from Judaism, which in turn, inherited some ideas of angels from the Ancient Egyptians. Some Egyptian Gods were more closely related to the Christian concept of angels. The Goddesses Isis and Maat were often depicted with wings. In this late medieval piece, ‘The Coronation of the Virgin; The Trinity; The Virgin and Child with Donors; The Crucifixion; The Twelve Apostles’ (1374) by Barnaba da Modena, we see 5 angels playing musical instruments celebrating the the Coronation. What did angels look like? Not all angels had white wings and gentle faces. Some were fearsome, shown wearing armour, wielding menacing swords, some donned bright clothes and played musical instruments. 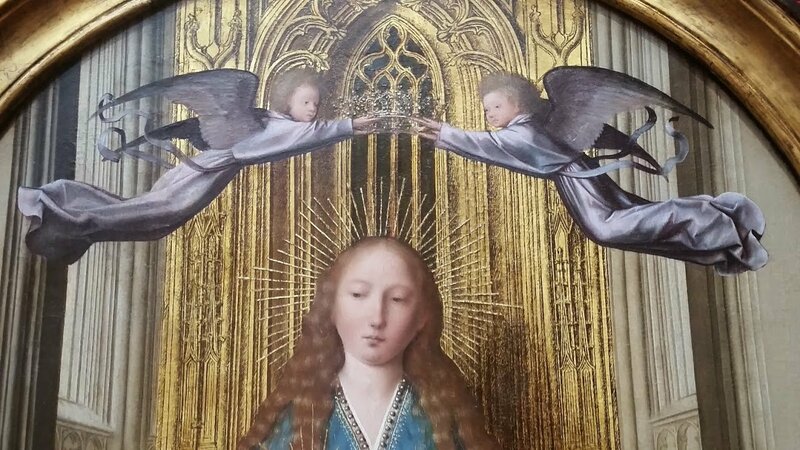 In the Renaissance, artists occasionally enjoyed depicting angels with coloured wings, as seen in this close up of a painting by Lorenzo Monaco, entitled ‘The Coronation of the Virgin’ (1407). Putti, the small, chubby, male children frequently seen in Renaissance art are often confused with Cherubim, angels that have the 4 faces of different species: ox, man, lion and eagle. In the Classical world, Putti were winged infants who were believed to influence humans. Putti were revived in the Quattrocento by artists like Donatello who gave them a new twist by incorporating them as angelic looking beings. Adding to the confusion are depictions such as this painting by Carlo Crivelli, ‘The Dead Christ Supported by Two Angels” (1470-1475). These are not Cherubs or Putti, but angels! Angels had their own hierarchy. Medieval theologians categorised them into “Angelic Choirs”. There were many different variations of the hierarchy suggested by writers such Dante, theologians like Thomas Aquinas, and religious visionaries such as Hildegard of Bingen. This beautiful painting is a close up from the Fiesole San Domenico Altarpiece by Fra Angelico, ‘Christ Glorified in the Court of Heaven’ (1423-1424). The First Sphere in the Angelic Hierarchy includes: Seraphim, the highest angelic class, Cherubim, and Thrones (likened to Judaism’s Ophanim). They were keepers of God’s justice. From left to right, we have: The Archangel Michael, The Virgin and Child with an Angel, and the Archangel Raphael with Tobias. These 3 panels come from an altarpiece in the Charterhouse in Pavia, Italy, by the artist Pietro Perugino, ‘Three Panels from an Altarpiece, Certosa’ (1496-1500). The Second Sphere in the Angelic Hierarchy consisted of: Dominions, who are extremely beautiful and the taskmasters of other angels; Virtues, who keep the Cosmos in order; and Powers, the warrior angels who fight evil spirits and are keepers of history. The Archangel Michael, defeating Satan in, ‘Saint Michael Triumphs over the Devil’ (1468) by Bartolomé Bermejo. This piece was formerly in the church of San Miguel in Tous, near Valencia. The Third Sphere in the Angelic Hierarchy was made up of Principalities, also overseers of other angels. The are educators and guardians, often depicted with a crown and sceptre, Archangels, the Messengers and warriors of God. There are 3 Archangels recognised by the Catholic Church: Michael, Gabriel and Raphael. In the Eastern Orthodox tradition, they recognise a 4th Archangel, Uriel. Lastly, Angels were the lowest order, and involved themselves in human affairs, often as messengers. In this work by Domenichino, ‘Landscape with Tobias laying hold of the Fish’ (1610-1613), the Archangel Raphael comes to Tobias and instructs him to catch the fish that attacked him in the river Tigris. Tobias then uses the fish to cure his father’s blindness.